Several years ago, approximately 200 to 2,000 individuals experienced kidney failure, many eventually dying. This represented one of the worst examples of herbal toxicity in modern history. The reason for the toxicity was due to a mix-up of the Chinese herb Stephania tetrandra with plants that contain the renal toxin aristolochic acid (AA), most notably Aristolochia fangchi. This event resulted in FDA issuing an importation restriction against a few dozen botanicals, most of which do not contain AA. 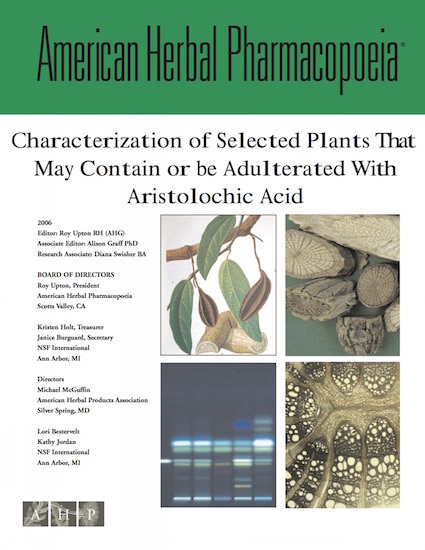 Detailed macroscopic, microscopic, and chemical characterizations of the majority of these botanicals are provided in this AHP publication and represent one of the most comprehensive characterizations on these herbs in the world, allowing manufacturers to ensure the products they make are free of AA.